If you’re considering your very first foray into Gunpla painting, choosing acrylic paint is a great choice. It’s water-based, which makes it both nontoxic and washable if you make a mistake. However, as contributor Megaplamo quickly discovered, it also dries quickly, making it challenging to take your time. His solution: creating a do-it-yourself wet palette. Read on to find out how. I love to use acrylic paint for Gunpla. It’s safe, easy to clean up, and doesn’t have a strong smell like enamel or lacquer paint. It’s perfect for hand painting small details on Gunpla, especially HG kits. At 1/144 scale, these models can have details too small to paint with a spray can or airbrush without excessive masking. So, what’s the downside? Acrylics tend to dry very quickly, sometimes faster than you can paint with them. In addition, once the paint begins to dry, it can be more difficult to achieve a smooth finish. I discovered a solution to this inconvenience while doing some miniature painting. Megaplamo handpainted these details on the 1/100 Full Mechanics Barbatos Lupus Rex using a wet palette. Having similar hobbies is a great way to mix and match techniques. 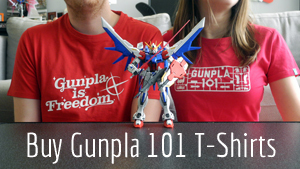 Although subject matter and assembly are very different, there is a lot that Gunpla modelers and miniature painters can learn from each other. Something that is well known by miniature painters, is the use of a wet palette, a simple tool that allows you to keep your paints wet while in use. This not only extends the drying time, but helps keep the paint smooth. I have created a tutorial on how to make a wet palette for those who want to do it themselves, plus a link to a professional-grade wet palette for those who want to save time and buy their own. You will start by cutting the parchment paper to fit the shape of the sponge. You can use a pencil to draw an outline around the sponge if you like, but it doesn’t need to be perfect. The main goal is just to match the parchment paper to the sponge without going over the edges too much. Parchment paper, which is usually used for cooking, has been coated so it can serve as a nonstick surface, perfect for paint. Eventually, this parchment paper will be the base of your palette. Next, wet the sponge and place it on the lid of the Tupperware. The key is to place it in a way you can close the Tupperware around the sponge when not in use. Soak the whole piece of parchment paper in water for around 7 minutes. You will want to press the parchment paper to the damp sponge so it adheres. You can now put a few drops of paint on the parchment paper and start painting! Now your paint will stay wet so long that you can extend painting sessions over multiple hours. When you want to take a break, just seal the Tupperware container over the lid to preserve your paint a few more hours. Before writing this article, I found that it could keep for around 8-10 hours before the paint became too dry to apply smoothly. This is a huge improvement compared to the few minutes you would normally have before it starts to dry. I recommend that you try your wet palette out with a small amount of paint and give yourself time to get used to it. I’ve had the best results using Vallejo, and if you use hybrid paints like Tamiya or Mr. Hobby, then I recommend adding a little bit of paint thinner to the paint before brushing. For those who would rather save time DIY-ing and spend more time Gunpla-ing and are interested in purchasing a professional wet palette, check out the Masterson Wet Palette. Whether you make it or buy it, I hope this is a helpful tool to add to your Gunpla arsenal that will encourage you to be more adventurous with your hand painting.